In order to provide services, healthcare practices must collect pertinent information from patients. This data gathering often includes many sources of information, across different types of technology, among multiple vendors. Good business practices and health records management is supported by three agreements your healthcare must have: information manager agreement (IMA), information sharing agreement (ISA), and successor custodian agreement. For instance, when a patient attends a clinic, their details are nearly always entered into a computer software program to maintain demographic information, manage patient appointments, and to process payments. Often, health service providers (including physicians, pharmacists, chiropractors, dentists, psychiatrists and more) record their patients’ notes into an electronic medical record (EMR). Patient information is shared between providers where required. For example, when the patient visits a diagnostic lab for testing, results are often transmitted electronically to the ordering physician’s fax machine or to the EMR. Custodians including physicians, pharmacists, chiropractors, dentists, and psychiatrists, as defined by the Alberta’s Health Information Act (HIA), must follow HIA legislation when they collect, use, and disclose health information. Often, custodians are also the owners of independent healthcare practices. However, an owner of a healthcare practice is not the custodian if they are not also an active member of a regulated health profession named as custodians in the HIA. The HIA allows custodians to contract with other health service providers and vendors for the purposes of providing information management or information technology services, so patients can receive health services, and make payments. This often requires the custodian to share patient information with a vendor (or give them access to) so the vendor can process, store, or provide information as needed. The custodian selects one or more business to provide the services, equipment, or software to assist in the management of health information. For example: EMR provider, contracted transcriptionist, billing agent, remote backup service, etc. These businesses are known in the HIA as information managers. Before sharing health information with someone else, the custodian must ensure that the partners and vendors have reasonable safeguards in place to protect sensitive health information. The custodians must ensure that there is a written agreement between the custodian and the information manager. These agreements are known as “Information Manager Agreements.” This requirement is stated in the HIA section 66(2). The Information Manager Agreement (IMA) is one of three crucial agreements a healthcare practice must have in place. You are in breach of the HIA. You may incur fines under the HIA. You may face sanctions and disciplinary actions from your professional regulatory college. Almost certainly, you will encounter conflicts, poor communication, between yourself and the vendor(s) and the other participating custodians in your practice. You may lose control of the health information as reported in the Investigation Report H2013-IR-01from the Alberta Office of the Information and Privacy Commissioner (OIPC). Who Must Create the Information Manager Agreement? 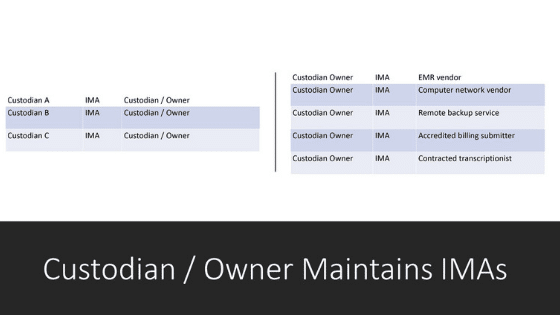 The custodian is responsible to ensure that there is an appropriate IMA created and signed. The information manager can assist the custodian by preparing templates of the IMA including specific details of the services that they will provide and the safeguards that the vendor will implement to protect personal health information. A few important notes about IMAs. IMA must be signed by the custodian. Agreements signed by individuals who are not custodians are not valid under the HIA. 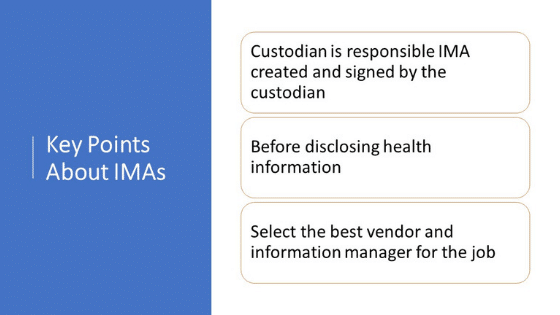 Custodians are required under the HIA to have an IMA with the vendor before disclosing health information. If there is no agreement in place, the custodian is in breach of the HIA. Custodians are responsible for the health information that they collect, use, and disclose. Therefore, the custodian is responsible for the IMA and to ensure that the health information will be handled confidently and securely. The custodian can select the best vendor and information manager for the job. The vendor who understands the requirements of the HIA and who can demonstrate that they have implemented the appropriate reasonable safeguards and can assist the custodian to develop an appropriate IMA is, in my opinion, demonstrating a significant competitive advantage. All healthcare providers in a community practice should spend time when creating their business to establish good business practices, including developing written contracts and agreements to improve the efficiency of the business and to make things happen in the way that they are planned. Dr. Alice and Dr. Mark created a welcoming family medical practice in a new sub-division of their city. They each worked hard to attract new patients, hire and train staff, and develop a profitable business. In the last few years, Alice and Mark had differences of opinion on how to grow their business. In the end, Alice decided that this type of practice wasn’t for her. She decided to leave and join a larger practice in a neighbouring subdivision. Alice wanted to take her patient’s records with her to her new practice and continue to see her patients at the new location. Mark, who had signed the IMA with the EMR vendor, did not agree to Alice’s request to transfer her patient records to her new group practice. Alice and Mark argued and eventually involved a professional mediator to help them resolve their business conflict. Hurt feelings between the providers and staff, costly delays in their business and expenses could have been avoided if Alice and Mark had established clear expectations in the event of the termination of their business partnership when they started their group practice. An IMA between custodians in a group practice is a recommended best practice. When the practice has multiple providers, the owner and custodian frequently assumes responsibility for maintaining the contracts and IMAs with the vendors. Each of the participating healthcare providers may delegate the responsibility of maintaining the vendor arrangements to the custodian owner. This can be achieved with an IMA between the owner / custodian and each participating custodian. Each healthcare provider custodian is considered the custodian of the health information that they collect. The custodians can jointly agree to all use the same EMR. This provides continuity of care for the patients and economy of scale for the participants of the practice. When the owner/custodian signs the agreement with the EMR, they become the signatory custodian. The EMR vendor takes their instructions from the signatory custodian. The owner / custodian is now an information manager for all the participating custodians. but does not become a custodian of the health information provided to them in their roles as an information manager. Dr. Bill opened his medical practice, ABC Clinic. Later, additional physicians were recruited to work at ABC Clinic. The physicians are each custodians as defined by the HIA. Dr. Bill assumes the responsibility for the operations of the clinic including the computer network and the contract with the EMR vendor. Dr. Bill is the information manager for the patient records at the clinic. Each physician signs an IMA with Dr. Bill and agree that he will continue to manage the patient records on their behalf. Dr. Bill is operating as an information manager. In his role of the information manager, Dr. Bill must follow the instructions from each physician, the custodian, as it relates to the management of their patients’ records. When you have more than one physician in your practice, you need an agreement about how you will decide to manage the personal health information in your practice. 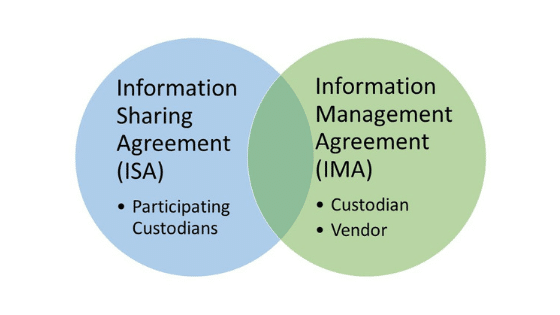 An Information Sharing Agreement (ISA) focuses on the internal decision making about all things related to personal health information whereas, an IMA is an agreement with a single vendor about the services that the vendor provides. An ISA may include things related to the services that a vendor provides but is not limited to just vendor services. It also includes decisions about the process to ensure appropriate role based access to personal health information in the EMR, computer network, and paper formats; the regular review of health information privacy and security policies and procedures, ensuring privacy and security awareness training, the regular review of administrative, technical, and physical safeguards in the practice, and so on. In larger organizations or when several smaller organizations participate in an information sharing initiative, a Data Management Committee may provide oversight and facilitate this process. An ISA is a requirement of the College of Physicians and Surgeons of Alberta. Identifying a successor custodian is also a requirement of the College of Physicians and Surgeons (CPSA). As a business owner, you need to plan a successor to the business. This might be an interim or short-term decision to ensure continuity during an absence or future retirement planning or unexpected illness or death. In healthcare, physicians and custodians have the added responsibility as the ‘gatekeeper’ for patient records. 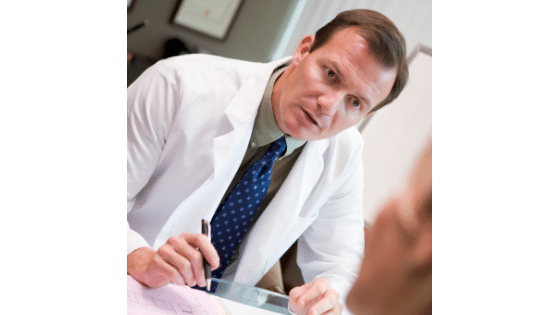 In the event of a sudden inability to meet these responsibilities, physicians need to identify a successor custodian to ensure appropriate and continued access by patients to their health information for their continuing care and treatment and to ensure that the continuing confidentiality, security, and access to patient records continue to be fulfilled. Have you identified a successor custodian? Each of the physicians in your group practice should also identify their own successor custodian. A chiropractor, as a custodian of health records, is responsible for the care and control of the health records in their practices as required by the Health Information Act of Alberta. A custodian of active chiropractic files must be under the custody or control of an active, registered member of the ACAC. Note that under the Health Information Act, a chiropractor may disclose files to another custodian who is not a chiropractor, and only a chiropractor may have custody or control of chiropractic files. Chiropractic files disclosed to a non-chiropractor should no longer be considered chiropractic files. A custodian must implement technical and physical safeguards to protect the confidentiality of the information and privacy of individuals as well as protections against reasonably anticipated threats to the security or integrity of the information. A custodian must also defend against unauthorized uses, disclosures or modifications of the information. Safeguards must be periodically assessed and documented in policies and procedures. If you are working in an owner/custodian scenario discussed above, clearly identifying a successor custodian becomes imperative. An unplanned absence of the owner / custodian can seriously jeopardize the business and the continuing care and treatment of patients. The custodian can, but is not required to, name another custodian in the same practice to be their successor. Whatever your decision, ensure that this is well documented and easily accessible to the other custodians and key decision makers in your organization in the event of an emergency. The best time to create IMA, ISA, and Successor Custodianship Agreements is when you start your healthcare business. The second best time in now. 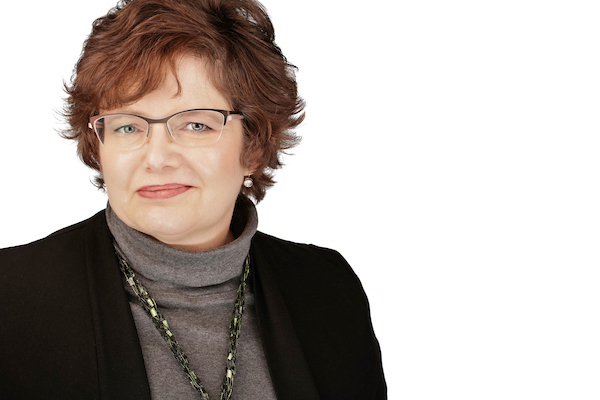 If you need assistance, contact Jean L. Eaton, Your Practical Privacy Coach and Practice Management Mentor with Information Managers. I’m here to help you with your Practice Management Success. If you are a member of Practice Management Success, login here to access the Top 3 Agreements.